Okay, take a deep breath, if you (somehow) haven’t heard about this dress you’re probably sat reading this thinking either one of two things; “What a stupid question, it’s obviously blue and black” or “it’s white and gold, why?”. Now you’re thinking “why is this up for debate, I can see what colour it is!”. All of us at the office see a blue and black dress but when showing the photo to my family, I got a mix of answers – sparking a confusion-filled debated. It all began when a blogger took to tumblr to settle a debate between her and her friends on the colour of the dress, instead of getting an answer it spawned thousands of questions. The photo has since gone viral with celebrities joining in on the debate. Even Kim & Kanye, or KimYe are on different sides of the debate! This is the reaction of hundreds of thousands of people all over the internet in the past 24 hours. 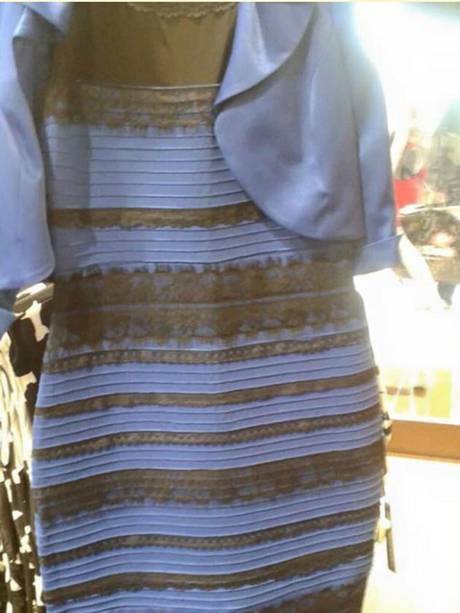 There are many theories about why people see this dress in different colours, some a lot more farfetched than others. It’s being said that if you see blue and black you are depressed. Before you call a phychiatrist I’d like to assure you that this is not the case. I would also like to point out that neither the Illuminati or CIA have anything to do with this – so take your tin foil hat off! So, unfortunately, no matter how much you squint, change the angle of your laptop or blink you will only see the dress the way you see it. I’ll sign off with this next photo which will either put your mind at rest or infuriate you to no end.